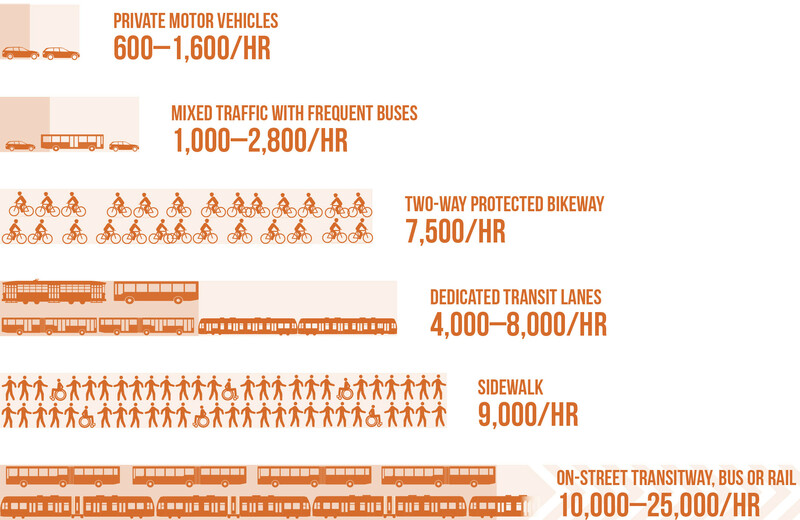 Transit streets are designed to move people, and should be evaluated in part by their ability to do so. Whether in dense urban cores, on conventional arterials, or along neighborhood spines, transit is the most spatially efficient mode. Traditional volume measures fail to account for the entirety of functions taking place on urban streets, as well as the social, cultural, and economic activities served by transit, walking, and bicycling. Shifting trips to more efficient travel modes is essential to upgrading the performance of limited street space. Using person throughput as a primary measure relates the design of a transit street to broader mode shift goals. The capacity of a single 10-foot lane (or equivalent width) by mode at peak conditions with normal operations. 60 people per meter per minute, allowing 1.5 sq. meters per pedestrian and a 75 meter per minute walking speed. “Ch 6, Bus Transit Capacity.” TCQSM, 3rd Ed. (2013). Zhou et al. measured 2,500 bikes per meter per hour on cycle tracks in downtown Hangzhou. Dan Zhou, et al. Estimating Capacity of Bicycle Path on Urban Roads in Hangzhou, China (2014). While street performance is conventionally measured based on vehicle traffic throughput and speed, measuring the number of people moved on a street—its person throughput and capacity—presents a more complete picture of how a city’s residents and visitors get around. Whether making daily commutes or discretionary trips, city residents will choose the mode that is reliable, convenient, and comfortable. 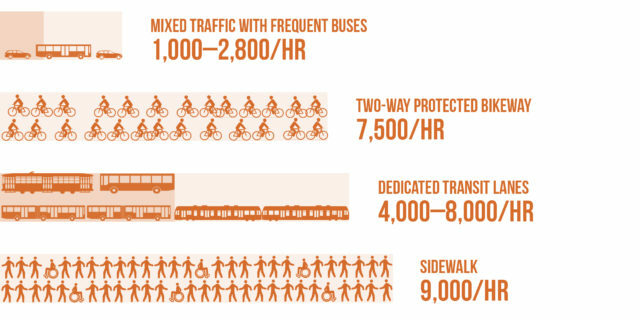 A reasonable planning-level capacity for a dedicated transit lane is 80 buses per hour; assuming 100 riders per vehicle (a comfortable articulated bus capacity), 8,000 riders per hour can be moved through a single transit lane. At two-minute headways (or 30 buses per hour), a standard 40-foot bus, assuming 60 passengers, moves 1,800 passengers per hour. High-capacity LRVs, running four cars per train with a capacity of 125 riders, have a capacity of 15,000 passengers per hour. Transportation Energy Data Book, edition 34 (2015). 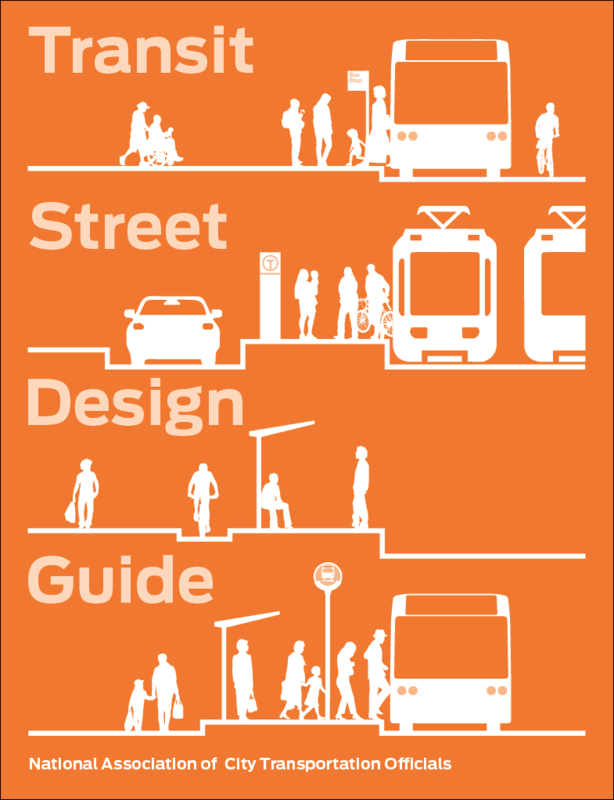 Streetcar and Light Rail Streetcar and Light Rail Characteristics. Regional Transportation District (2012). References for Designing to Move People: 5 found.